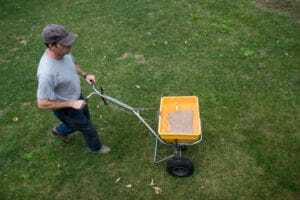 What is the Best Fertilizing Schedule for Your Lawn? Fertilizing your lawn effectively can be a challenging task. Fertilizer slowly releases nutrients into your soil over time, allowing the grass root system to feed and spread throughout your yard. Choosing the proper schedule for your lawn includes evaluating the size of your yard, the grass type, the soil type, and the lawn’s drainage. Take the following factors into account as you determine a fertilizing schedule for your lawn. Measure the square footage of the part of your yard you will be fertilizing. To do this, multiply the length by the width, then subtract the square footage of places in your lawn that won’t be fertilized, like your driveway, shed, pool, or house. Green Lawn Fertilizing can provide you the exact dimensions of your lawn in a couple minutes using our special online measuring tool if you would like to give us a call. Determine whether your yard has cool-season grass, warm-season grass, or a combination of both. Cool-season grasses are the most common type in Pennsylvania, New Jersey, and Delaware, but it is best to be sure before purchasing your fertilizer. Cool-season grasses tend to stay green nearly all year in cool zones. Determine your soil’s type and drainage capabilities. Sandy soil drains well, giving the grass roots abundant oxygen, but it can leach nutrients because its porous consistency allows water to drain too fast. Soils like clay can be fertile, but sometimes result in unhealthy turf because of poor drainage. There are some general guidelines for fertilizing a typical Northeast lawn with cool-season grasses. Remember that every lawn is different and there is no one-size-fits-all fertilizing schedule–certain aspects will vary depending on your lawn’s soil and drainage. Apply 4 lbs of nitrogen-rich fertilizer per 1,000 square feet in May, June, August, September, and mid-October. Apply 3 lbs if the grass clippings have not been removed because they act as an organic fertilizer. Some cool-season grasses require less water and fertilizer than others. They can be fertilized less frequently, too. If the grass clippings on this kind of lawn have been removed, apply 2 lbs of fertilizer per 1,000 square feet in August and mid-October. Grass clippings left on lawns with these characteristics generally only need fertilizing in September with 1 lb per square 1,000 feet. Need assistance as you settle into a fertilizing schedule of your own? Call our experts at 888-581-5296. We’re here to help you achieve a lush, green lawn you’ll love.